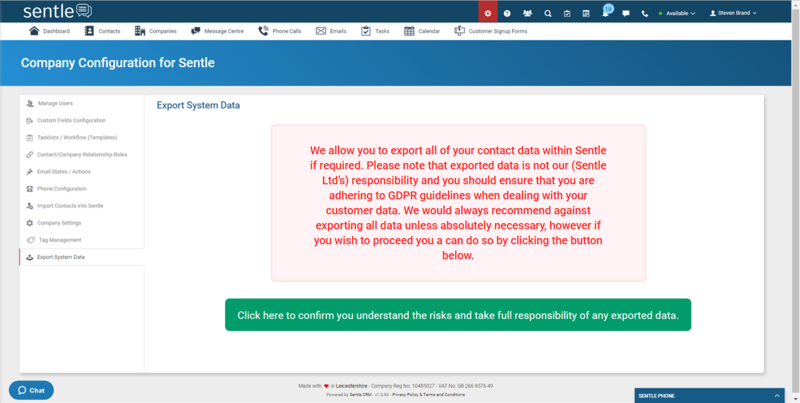 To help you comply with GDPR regulations, your are able to export all contact data and activity out of Sentle. We recommend you only do this if you have a robust data storage policy in place. To export all data and activity, navigate to the 'Export System Data' tab that is located in within the System Configuration area as below. When happy to export, click on the large green button and agree when prompted to begin the download. Data will be delivered in Excel format as below. To export data per contact use the cog located in the top right of the contact window and select the 'Export Contact' option.